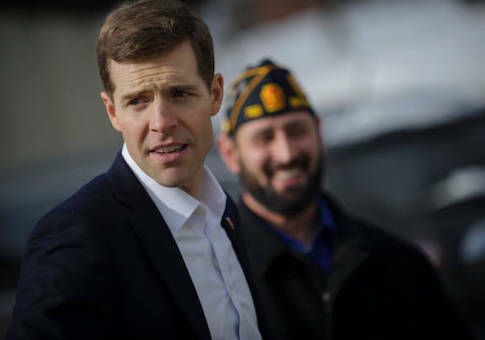 Efforts by Pennsylvania Democrat Conor Lamb to distance himself from Democratic leadership were briefly put on hold last week when he attended a Washington, D.C., fundraiser hosted by a group of Pennsylvania Democrats loyal to House Minority Leader Nancy Pelosi. Lamb, running in a special election for a seat representing a district that voted overwhelmingly for Republicans in 2016, announced earlier this month that he would not support Pelosi if elected. However, the New York Times reported that members of the Pennsylvania Democratic delegation, all of whom voted for Pelosi to lead the House last year, held a $1,000-a-person fundraiser for Lamb. "I’m more bullish on our chances than I think the consensus," Rep. Brendan Boyle (D., Pa.), one of the hosts, told the Times. "While it would be an upset, we can win it in this environment." It is unclear who else co-hosted the event with Boyle, but all of the four remaining Pennsylvania Democrats in the House—Reps. Robert Brady, Dwight Evans, Michael Doyle, and Matt Cartwright—aligned themselves with Pelosi during the November 2016 leadership challenge from Ohio Rep. Tim Ryan (D., Ohio). Of the group, only a spokesman for Brady responded, saying, "I don’t think he was there. And he absolutely supports Leader Pelosi." Also announcing new financial support for Lamb this week was the Democratic Congressional Campaign Committee, the campaign arm for the Pelosi-led House Democrats. The DCCC said late Thursday it was making an initial buy of $69,000 to get on the airwaves in support of Lamb. Lamb's decision to buck Pelosi in early January was a strategic one—the district was carried by Trump by double-digits and attacking Pelosi has proven to be one of the most successful strategies by Republicans. "They can throw anything they want at him, but he’s already said he’s not voting for Pelosi as speaker," Pennsylvania Democratic chairman Marcel Groen told the Times. Lamb is not running the typical Democratic campaign. His campaign's first ad only mentions the party to say he's willing to "work with Democrats and Republicans" and that both parties "need new leaders." The ad also says Lamb, a former Marine, "still loves to shoot," along with a picture of him shooting a rifle down range. John Fetterman, the Democratic mayor of a western Pennsylvania town just outside the district, told the Washington Free Beacon that distancing yourself from Pelosi is smart if you want to win. "There are political realities in a district Trump won by 19 points a year ago," said Fetterman, currently running to be Pennsylvania's lieutenant governor. "They're doing a lot of smart things. They've distanced themselves from Nancy Pelosi." The announcement by Lamb failed if the goal was convincing Republicans to abandon their go-to strategy. They responded to Lamb's distancing himself from Pelosi by telling the Washington Free Beacon they weren't buying it. "The only person Conor Lamb is fooling is himself," said a spokesman for the National Republican Congressional Committee. "Nancy Pelosi is House Minority Leader and Lamb will gladly follow her in whatever direction she takes the Democratic caucus." The Republican group put a visual to that statement on Thursday, releasing a new ad portraying Lamb as an actual "little lamb" who follows Pelosi over to her "liberal views." Lamb has not responded to requests for comment on whether Pelosi was discussed during the fundraiser. This entry was posted in Politics and tagged Conor Lamb, Nancy Pelosi. Bookmark the permalink.